For the 39th consecutive time, the Kentucky High School Powerlifting Championships occurred again and this year’s version showcased some incredible performances across the different weight-classes. KPGFootball covered the event and is pleased to be able to share some of the spectacular feats of strength, power, and explosion we were fortunate enough to witness. DC Boone cemented his legacy as one of the premier heavyweight powerlifters in the history of the sport. The mammoth 344-pounder, headed to Eureka College to further both his academic and football-playing careers took all of us along a spectacular final ride on the rocket ship which has constituted his high school powerlifting career. The defending heavyweight champion from 2018 repeated and smashed the former state record bench press mark of 435-pounds. Boone stroked 475-pounds and then narrowly scratched at 500. He totaled 700-pounds for the meet (bench and power clean). William Long, the defending State Champion at 250-pounds, weighed in at 247 and looked poised to break his weight-class’ bench press mark too. Long came into the meet planning to open at 385 on the bench with the plan being to easily exceed the present state mark of 390-pounds on his second and then third attempts. However, what Long didn’t count on was getting injured three days prior to the event. With a strained pectorlis muscle and under significant pain, Long had to use a “close-grip” to even tolerate the lift. He, somehow (and we don’t know how) was able to rack 370-pounds on the bench (though injured) and racked 260-pounds on the power clean to win his second, consecutive, Powerlifting State Championship though only a sophomore in high school. Long took his weight-class by 45 pounds, pain or no pain. What a tough kid. Ronnie Collins who we believe weighed in at 173-pounds just mounted an unimaginable performance. In so doing he nullified another incredible performance from Cade Bleidt who has had the misfortune of having to compete against “once-in-a-lifetime type” lifters two years straight. Last year, at 155-pounds, Bleidt finished runner-up to four-time State Powerlifting Champion “Iron” Dan Fors. This year Bleidt moved up twenty-pounds to 175. Cade bench-pressed 270-pounds and power-cleaned 275-pounds for a combined total of 545-pounds. That amount would have won the class at last year’s meet by 45 pounds. This year, Ronnie Collins bench-pressed 305-pounds and power-cleaned a Kentucky record 335-pounds for a total of 640-pounds, combined lift. As you would probably guess, his combined lift total was also a Kentucky record in the 175-pound weight class. Bleidt finished runner-up again this year and this time by a whopping 95-pounds. Cade Bleidt may be the un-luckiest powerlifter in Kentucky history, though a fantastic performer in his own right. Guy Blyth, a middle schooler, broke the middle-school Kentucky record for bench press and power clean in his weight-class (235). Imagine this, he hasn’t yet entered 9th grade but still bench pressed 245-pounds and power cleaned 220-pounds for a combined lift of 465-pounds. Logan Green weighing only 155-pounds, tied the Kentucky record in that class in the power clean at 280-pounds on his way to narrowly taking his weight class over Tyler Thomas by 10 measly pounds. Imagine having to tie a Kentucky record to eek out a victory over the runner-up. Makes you appreciate the performance of both lifters. Jayden Neace, from Perry County Central, set a new Kentucky record in the power clean, by a 220-pound lifter, and still finished second in his weight class to North Hardin’s Darren Green. Both lifters finished with 620 combined pounds but the lighter lifter wins at the State Championships. Darren Green was crowned champion owing to his weighing in at 217.2 pounds. Neace’s weight, when he weighed-in was 217.8. It came down to a matter of ounces. 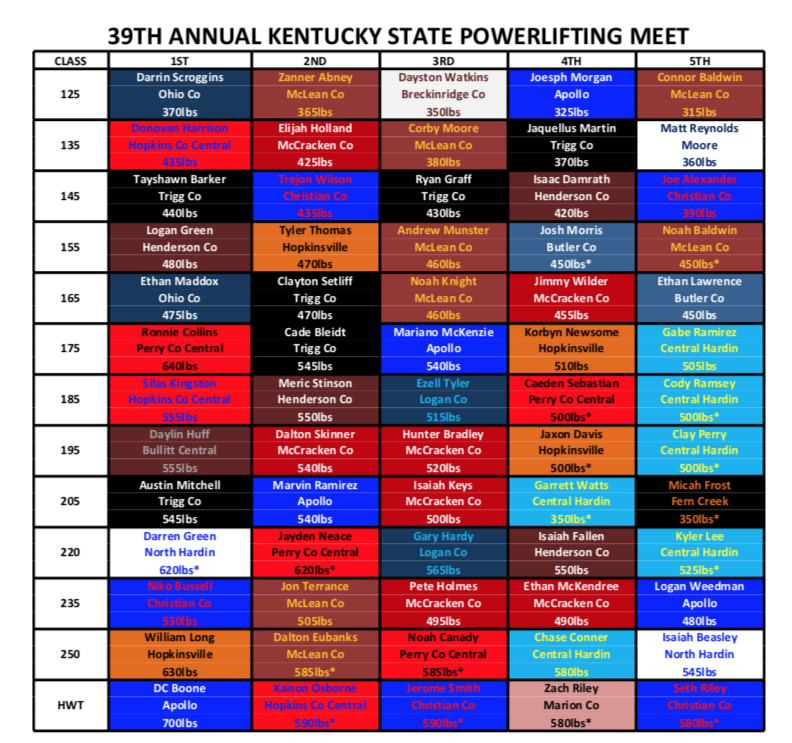 There were more lifters this year than competed last and the power-cleans, absent a few performances, really stole the show at the 39th Kentucky State Championships. Boone hitting 475-pounds on the bench press was the highlight of the meet and Central Hardin, once more, ran a first-class championship meet. 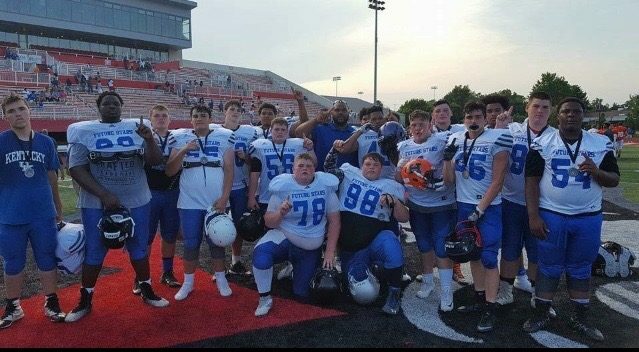 Can’t wait to see what some of these guys do on the football field in the Fall, whether in college or high school. Reporting for KPGFootball, this is F.W. Long, reminding all of you ballers out there to PLAY THROUGH THE WHISTLE.